What if Iʼm not sure whatʼs on the films and tapes? Is there a way we can preview them before putting them on a DVD? We know how frustrating it is to be in the dark about not knowing whatʼs on an anonymous reel of film or home movie tape. For this reason, we transfer your mystery reels and tapes at the very beginning to provide you with one of two ways for helping in identification: 1) We can capture frames representative of the main subjects or events of the movie and send as attached files to your email, or: 2) Transfer to working DVDs - that are more comprehensive in terms of helping you preview everything on your film reels and tapes... so you will know exactly what to keep, what to delete, and more precisely in what order to rearrange the scenes before production of your finished DVD even begins! Just make notes on your editing changes and weʼll take it from there. Working DVD transfers involve no additional charge in addition to the transfer costs for your film reels & video tapes, and are expected to be paid in advance. Do you perform all of your transfer work on site or do you ship it somewhere else? There are a number of services such as ours that opt to ship their jobs out to a subcontractor at another location. Here, we perform 99% of all the work on site, and that has been our standard operational procedure ever since we became established in 1992. Can I ship my materials to you or do I have to come to your studio? Whatever is more convenient for you. If you choose to send your materials to us, we recommend you ship them in box secure with packing material through a trackable carrier such as the US Post Officeʼs Priority Mail, UPS or Fed-EX. Be sure to include all of your contact information in the package (i.e., name, address, phone number and email address). There is no need to include any initial deposit, as we will contact you for your payment prior to mailing back the job together with all of your original materials. Typical turn-around time for our projects is between one day and three weeks, depending on the type of project you have and how busy we are at the time. We always try to meet our clients needs however, so if your project has a specific deadline, simply let us know and we will do everything we can to accommodate you. For a more specific estimate of our current turn-around time for your specific project, call or email us anytime. Do you offer Pick up services? Yes we do, depending on your location and the type of project you have. Give us a call so we can discuss it with you, and weʼll try to help you get your project to us. Videotapes – VHS, VHS-C, S-VHS, S-VHS-C, Betamax, Hi8, Digital8, Video8, 8mm video cassette, MiniDV. Film – 8mm, Super 8mm, and 16mm. Photos – 35mm Slides, Negatives, Film Transparancies, and Photo Prints. Audio – Audio Cassette Tapes, Reel-to-Reel Tapes, Records (LPʼs, etc. ), 8-Track tape. Will the DVDs play in my DVD player? Each DVD is professionally mastered and authored, and will play in all major DVD players and computers. We can do just about whatever you want in the way of transitional effects, such as fades, dissolves, wipes, etc. We also provide introductory titles that can be transcribed from the original cans, reels, boxes, and video tapes. We try to match the visuals with music from the period (mainly instrumental), and have a separate sound track that can be used for a voiceover or narrative, should you choose to add one. Yes, our whole system is digital. We take your tape and convert it from analog to digital, and later edited using our dv editing software. Our final product looks as good as the original video, and you can view it 1,000 times without any loss of quality. Weʼve heard of an endless tape loop or loop DVD, a DVD which plays our program over and over and over. Is there such a thing? Yes. We can make your DVD loop over and over again. This is great for trade shows, friends and family gathering or your business reception area. 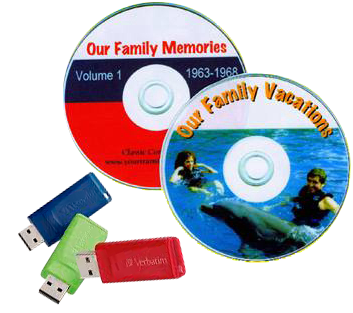 We can transfer your home movies, Company advertisement or your professional photo video to an endless loop DVD.